So about two weeks before Christmas, my sister-in-law drops a hint that she would like a scarf. Since, I wanted to make part of the gifts that I gave away, I was okay with this. And then it spiraled out and I wound up making a scarf for my mother-in law and one for my grandma. This is the scarf I made for my SIL. She wanted a long skinny scarf. I decided to use my stash yarn. This cost me about 50 cents to make. I had bought the yarn on sale for a quarter a skein and used almost 2 skeins. 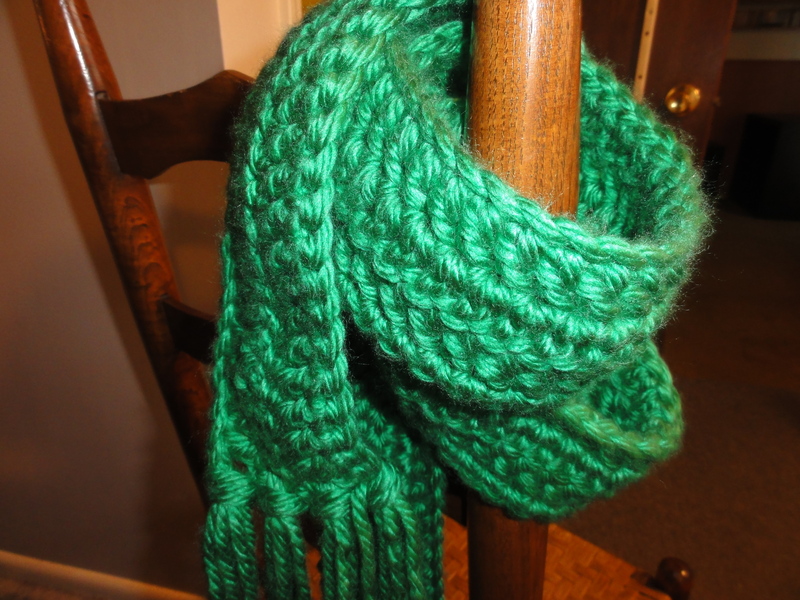 Cut 24 15″ strands of yarn and attach to end of scarf, to create fringe. The great thing about the Hometown USA is that it is a very bulky yarn and you are done in no time. With Cincinnati Red Chain 153. Turn and hdc in third loop. hdc across. Chain 2 changing to New York White. hdc across in back loops only (blo). Chain 2 changing to Cincinnati Red. hdc in blo across. Chain 2 changing to New York White. hdc in blo across. Cut 12 pieces of each color yarn. Using one strand of each color attach six fringes on each end.